Protestant Scholasticism taught that the Decalogue summarily contains the Moral Law and is the inscripturated form of the natural law, as to its substance. A distinction was made between substance and form. Substance is one; form (and function) may vary. For example, when the Westminster Larger Catechism Q. 98 says, “The moral law is summarily comprehended in the ten commandments,” it refers to the fact that the substance (i.e., the underlying essence) of the Moral Law is assumed and articulated in the propositions of the Decalogue as contained in Exodus 20 and Deuteronomy 5. The form (and function) fits the redemptive-historical circumstances in which it was given. The substance, or underlying principles, are always relevant and applicable to man because he is created in the image of God. The application may shift based on redemptive-historical changes, such as the inauguration of the New Covenant, but its substance and utility never changes. [S]pecifically and predominantly, the Decalogus, or Ten Commandments; also called the lex Mosaica …, as distinct from the lex ceremonialis …and the lex civilis, or civil law. The lex moralis, which is primarily intended to regulate morals, is known to the synderesis [the innate habit of understanding basic principles of moral law] and is the basis of the acts of conscientia [conscience–the application of the innate habit above]. In substance, the lex moralis is identical with the lex naturalis …but, unlike the natural law, it is given by revelation in a form which is clearer and fuller than that otherwise known to the reason. ... not present an unbloody sacrifice of Christ taking place now, but it points back to the once for all sacrifice 2000 years ago on that cross of Calvary. The Lord Supper is also a spiritual oblation, i.e., an offering, of all possible praise unto God for the once for all sacrifice of Christ. In the Lord's Supper, we thank and praise the Lord for what Jesus did for us on the cross. The Holy and Divine Liturgy, because the Church's whole liturgy finds its center and most intense expression in the celebration of this sacrament; in the same sense we also call its celebration the Sacred Mysteries. We speak of the Most Blessed Sacrament because it is the Sacrament of sacraments; the Eucharistic species reserved in the tabernacle are designated by this same name. At the heart of the Eucharistic celebration are the bread and wine that, by the words of Christ and the invocation of the Holy Spirit, become Christ's Body and Blood. Faithful to the Lord's command the Church continues to do, in his memory and until his glorious return, what he did on the eve of his Passion: "He took bread...." "He took the cup filled with wine...." the signs of bread and wine become, in a way surpassing understanding, the Body and Blood of Christ; they continue also to signify the goodness of creation. Thus in the Offertory we give thanks to the Creator for bread and wine,152 fruit of the "work of human hands," but above all as "fruit of the earth" and "of the vine" - gifts of the Creator. the Church sees in the gesture of the king-priest Melchizedek, who "brought out bread and wine," a prefiguring of her own offering. This covenant [the Covenant of Grace] was differently administered in the time of the law, and in the time of the gospel: under the law it was administered by promises, prophecies, sacrifices, circumcision, the paschal lamb, and other types and ordinances delivered to the people of the Jews, all fore-signifying Christ to come, which were for that time sufficient and efficacious, through the operation of the Spirit, to instruct and build up the elect in faith in the promised Messiah, by whom they had full remission of sins, and eternal salvation, and is called the Old Testament. ...alvation and repentance. For example to the one who struggles with gossiping, repentance means being sorry for offending God by spreading rumors and secrets about someone and being sorry also for offending that person himself, maybe even going to confess your sin to them. Now, the works which will manifest your repentance are no longer spreading gossip, but rather restraining yourself from doing that. Rather than spreading falsehoods and rumors, seek to speak the truth in love and for the good of each other. We seek no longer to walk in sin, but walk in the ways of God and to please Him in all things. We seek to resist sin and to hate even the thought of sinning against Him. This is nothing less than I have tried to prove above and similar to what the Confession says. First of all, repentance is a saving grace. It is not something that comes from us but rather given to us. Second, it is a grace which makes us aware of the true sense of our sin, i.e., that it is committed against an infinitely righteous and holy God, but at the same time, we know that we may find mercy and grace in the arms of Christ. Third, repentance involves a turning away from sin toward God and obedience. I believe that the Bible teaches that there is no true faith without repentance, neither is there true repentance without faith in Christ. Therefore, I reject and abhor the views of those who would say that one can have Christ as their Savior, but doesn't need to have Christ as their Lord to be saved. They want to basically claim that if you ever believed that Christ died for your sins and you accepted Him, it doesn't matter what you do, you will be saved from God's wrath. You don't have to repent and amend your ways, but you simply have to put faith in Christ and accept Him. These groups also believe in what is called "once saved, always saved", which combined with their easy believism teaches that if one ever made a commitment to put their faith in Christ, even if they sin without repentance in the future, it doesn't matter, they're saved. They do not have to obey Christ as Lord of their life. Lev. 10:1-3 Now Nadab and Abihu, the sons of Aaron, each took his censer and put fire in it and laid incense on it and offered unauthorized fire before the LORD, which he had not commanded them. 2 And fire came out from before the LORD and consumed them, and they died before the LORD. 3 Then Moses said to Aaron, “This is what the LORD has said: ‘Among those who are near me I will be sanctified, and before all the people I will be glorified.’” And Aaron held his peace. I think the clearest and most cited example of the Regulative Principle of Worship is the case of Nadab and Abihu. In a sense, you may have sympathy with them and we may see the reaction of God as over the top. But then again, as priests, they had to listen carefully to what God commanded and do that, not turning to the right or to the left. 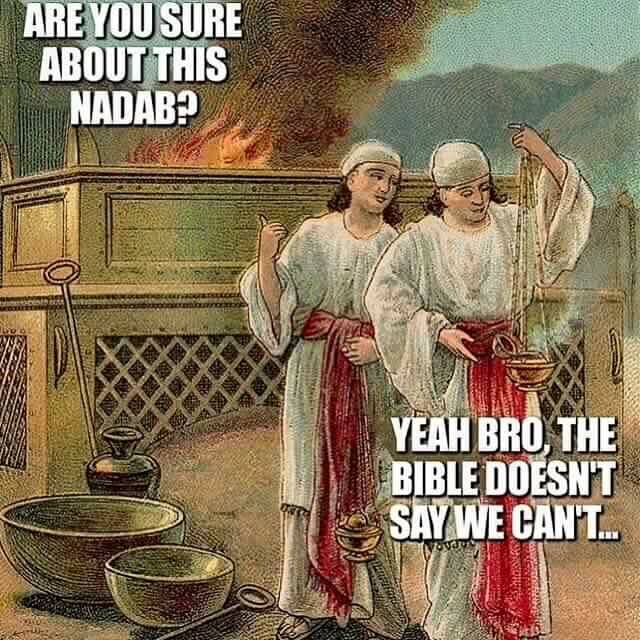 ‘The mere fact that they dared to bring “unauthorized fire” (the translation of the NIV) brought fiery death upon them.’In this case, as was with Cain and Abel, we have the principle of "what is not commanded, is forbidden." "Sacred Tradition and Sacred Scripture, then, are bound closely together, and communicate one with the other. For both of them, flowing out from the same divine well-spring, come together in some fashion to form one thing, and move towards the same goal." Each of them makes present and fruitful in the Church the mystery of Christ, who promised to remain with his own "always, to the close of the age". ...fession-Faith/dp/0852349173/ref=sr_1_1?ie=UTF8&qid=1425729332&sr=8-1&keywords=sam+waldron">Modern Exposition of 1689 Baptist Confession of Faith which was apparently supplied by the Westminster Confession of Faith 1646. ^ Wayne Grudem. Systematic Theology: An Introduction to Biblical Doctrine. (Grand Rapids, MI: Zondervan, 1994). Chapter 36, p. 723. ^ Catechism of the Catholic Church. ^ Taken from Matt Slick at CARM, The Roman Catholic view on justification. a, b, c, d Joseph Henry Thayer's Greek Definitions. Taken from the TheWord Bible Software. See reference for the Strong's number. ^ William D. Mounce. Mounce's Complete Expository Dictionary of Old and New Testament Words. (Zondervan, 2006). p. 146. ^ The Holy Bible: English Standard Version: The ESV Study Bible. (Wheaton, IL: Crossway Bibles. 2008). p. 2265.
a, b Mickelson's Enhanced Strong's Greek and Hebrew Dictionaries. Taken from the TheWord Bible Software. See reference for the Strong's number. ^ Jamieson, Fausset, Brown. Commentary Critical and Explanatory on the Whole Bible (Abridged). Taken from the TheWord Bible Software. In loc. ^ Explaining Regeneration Preceding Faith. ^ Grudem, Systematic Theology. Chapter 34, p. 704, n. 10. ^ 50 Things the Holy Spirit Does. ...er-11-1">a, b The Cambridge Bible for Schools and Colleges. Edited by J. J. S. Perowne. Taken from the TheWord Bible Software. In loc. ^ The Free Dictionary. Slave. ^ Robert Robinson, Come Thou Fount Of Every Blessing. ...r the Old Testament, the inconsistent use of the Elect’s Standard Version (haha) and typo’s. Other than that, 5 stars book. I will Lord willing, start reading the Kingdom of God some time soon.